A massive investment in education is the only way that the huge Roma minority in Romania can emerge from grinding poverty and marginalisation. If better educated, the Roma people could fill the gap created by the country’s falling population and provide future generations of entrepreneurs, scientists and skilled workers. Estimates of how many Roma are in Romania vary wildly. At the last census in 2001 well under a million Romanians declared th emselves to be Roma (fears of the holocaust linger on), but un-scientific estimates of 2 million or 3 million are made by Roma NGOs. But what is clear is that Roma communities can be found on the margins of most Romanian villages and many do not have identity papers, without which you cannot access public services. If one visits a Roma community, the real meaning of the word marginalisation becomes clear. In a typical Romanian village, the paved roads tend to stop where the Roma community begins. They have to cope without the utilities and public services which their non-Roma neighbours are routinely provided with. If children from these communities go to school they are discriminated against relentlessly and many drop out. The Romanian people are tolerant of the Roma way of life and public officials tend to make little or no effort to offer public services (or identity cards) to these marginalised people. The prevailing attitude is “they don’t want to work or study; they live off crime; so we leave them alone.” Most Romanian journalists seem to share these views. Experience in other EU Member States has shown that dealing with Roma poverty is difficult and results are intermittent. The prejudice is so deeply rooted and the problems are so widely spread that well-meaning social projects tend to have limited impact. And the Roma leaders lack the education required to provide the right kind of leadership that the Roma minority so obviously need. The Romanian Government allocate about €2 million a year to the Roma Party, ostensibly to help the Roma people. Unfortunately this money does not reach the people who need it and only a small cadre of politicians know where this money actually goes. If this cash were used to provide Roma children with school bursaries, it could have a big impact. Education is the only answer. Only a massive and sustained investment in education can ensure a solution that is acceptable to both the Roma minority (who jealously preserve their cultural independence) and mainstream society which desperately needs well educated people to replace those who are emigrating west. There are a number of compelling reasons why a long term educational investment programme is the only possible answer. Concentrating ones resources on one sector is far more likely to lead to a positive result than investing small sums in a wide range of projects. Prioritising education is something that is easy to understand for illiterate villagers and the most bone-headed public officials. If food, books and uniforms were provided free the main reasons for educational exclusion would be swept away. Romania has actually made good progress in getting marginalised Roma children into primary schools, and Gheorghe Sarau at the Ministry of Education has made heroic efforts to hire Romanes language teachers into Romanes speaking areas. Their job is essentially to teach the Roma kids the Romanian language. The problem is that this programme is not backed up by any investment in schools in Roma villages. But Romania’s educational system is an elitist one and what limited resources are available seem to be concentrated on the best performing schools in the big cities. Rural schools tend to be completely neglected, particularly those schools which have a majority of Roma children. A big part of the problem is the fact that Romanian politicians tend to ignore and belittle their peasant population, despite the fact that almost half the population live off the land. The media share this disdain for their rural brethren and when they do report from a village the people tend to be treated as victims or with irony. The Roma minority are currently perceived in Romania as a social problem and a source of national shame, but if there was a sustained investment programme in the education system the Roma minority could become part of the solution. This article was also published in EUObserver. Another large part of the problem lies in the very fact that in most cases involving Roma the word “Ethnic” is added and even pressed to the point by Roma NGOs. Do they not realise the segregation this word causes in itself? The Roma in Romania should be classed as Romanian Roma and only then will they have any chance of belonging in real terms. They are born Romanians, no matter weather are Roma or not if they are born on Romanian soil and this point is very important. Education is the only way forward but it must apply to not only Roma but the Romanian population too, who must learn to understand the cultural differences betwen themselves and their Romanian Roma counterparts who are equals and will prove it if given a chance of education for their future generations. Can you put my blog in your link on your blog and in return I will do the same? If we keep the gipsies are in Romania and the romanians are fighting this race the westerners will call romanians racists. If the gipsies are moving to Italy,UK or other WE country the westerners will mistreat this “thrash “race and will send the gipsies back to Romania. We didnt ask to have them in our land,but since we have them we have to live on. You should do the same isnt it? Racism is a ugly word no matter where it exists. It is learned early and inevitably passed on. Yes, education, more importantly at home, is key. And the Church in Romania? What is its position on this issue? The Church has an important role to play on this issue. 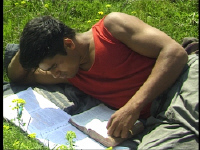 Ten years ago, I started a school for Roma children in Romania. I used my own money for it because absolutely no one thought it would succeed. Well now, ten years later, we have 92 children enrolled, and its quite a going concern. And yes we do have some state support, although of course we have to pay city tax on the building, and our assistance can come late or not at all. We have some international support, but not enough, and finding money to keep afloat is a day to day struggle. We have a lot of young people continuing in the school until they finish at ages between 12 – girls have a nasty habit of getting married at 12 – and boys think they don’t need much education after 16. We have managed to put quite a few of our students into state schools and with support, they have managed to actually STAY there and be successful. So where’s the problem? The problem is what happens to them AFTER they finish school. We can keep most of the kids in our school in education. No problem if you know how and have a good relationship with the community. But you just tell me where to get them jobs when they finish. And how to get them into university and keep them there, and then for those incredibly few who manage a university education, lets get THEM jobs. The current economic crisis has hit Romania too, and finding a job is hard for EVERYBODY. Throw into the pot that one is ‘cigani’ as well, and your goose is pretty much cooked. Gypsies have more rights to free education here than anywhere, they just don’t take it – they have reserved free admission in Universities, even, which other ethnic groups don’t have simply because they are part of that ethnic group. They have expensive palaces, expensive cars and all this from begging and stealing (not all of them but many more than any other ethnic group in Europe) yet everyone is pointing to Romania that we don’t allow them equal rights. Do they allow us equal rights? Hell, France keeps giving them money to come back to Romania… no-one has given me money to leave their country. Any article on how the Rroma people are being neglected, marginalized and discriminated against in Romania is simply ignorant and hypocritical. They have more opportunities than the average Romanian and they don’t take it because they like getting our money from the state or by stealing without doing actual work. By the way, why am I calling them Rroma… they’re Gypsies… they just changed that because it’s now synonymous to all the bad things here. I wonder what made that happen… it must be the bad racist Romanians and this is such by no fault of the gypsies. Next time they come to a country in western Europe, don’t send them to us… keep them and see how easy it is to educate them by force or any means… and see how little they’re willing to work… All the hard working gypsies I know are indistinguishable from the average person and as far as I can tell they feel the same way I do about their fellow ethnics… maybe even more so since in that ethnic group the hard-working ones are also educated, clean and much much poorer than the stealing, begging, welfare hogging majority. @Jennie Boughton: Congratulations, all these kids are from hard-working gypsy families, from the exceptions. When I see all the 5 reserved sits in my University filled by gypsy students 2 years in a row I will start thinking things are changing. So far I have seen 1 gypsy student in all my bachelor and master years.